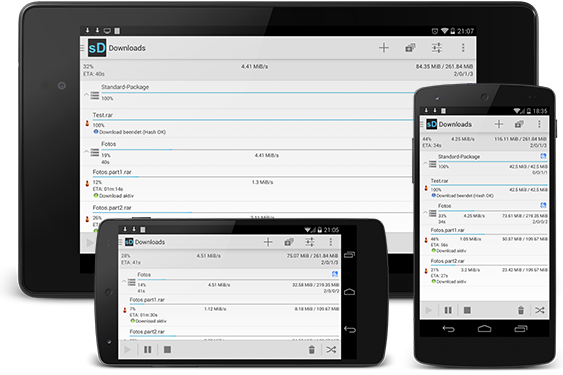 ShareDownloader - The Android-OCH downloader. 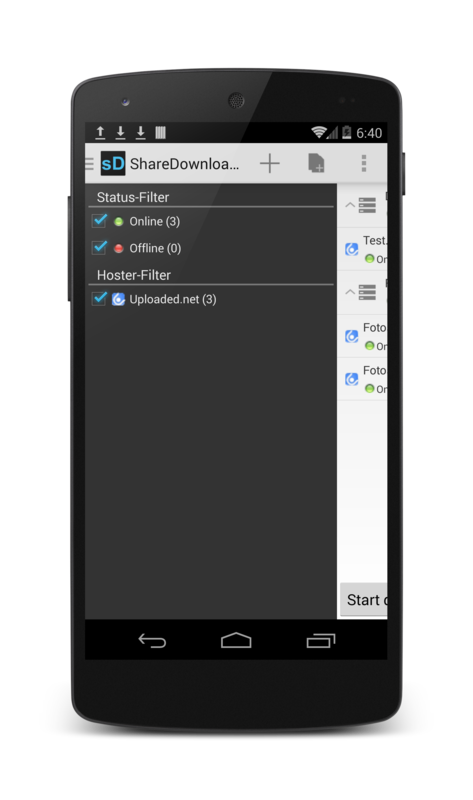 Sharedownloader is new android app, which combines various 1-click hoster in one App. ShareDownloader provides among others File-, Download- and Uploadmanager. Further accountinformation can be retrieved, e.g. points, balance, traffic etc. ShareDownloader can decrypt and process DLC - containers. The downloadmanager resume downloads automatically after connection abort, or wait while Wi-Fi is not available. Of course you can process usual HTTP-downloads with ShareDownloader. With ShareDownloader you always have overview about your OCH-accounts. You can easily view your account information, like e.g. your balance, available traffic or your remaining premium time. With the file manager you can easily manage files of your account, whether Uploaded.net or Netload.in etc. You can rename, delete or move files also create, delete, rename or move folders. The download manager provides ability for comfortable download of shared files, wether free or premium user. Further stream videos e.g. YouTube.com or Twitch.tv can be downloaded. Of course you can process usual HTTP-downloads with ShareDownloader. All supported hosters can be found here . Up to 16 files can be downloaded at same time and up to 8 simultaneuous connections (Chunks) per file can be established. Further you can limit download speed. An important features of ShareDownloader is the ability to save your files on network share e.g. NAS. Download can be processed via Wi-Fi or 3G network. If connection is lost, download will automatically resume as soon as connection is available again. ShareDownloader provides ability to decrypt links from encrypt services e.g. Share-Links.biz, ncrypt.in etc. 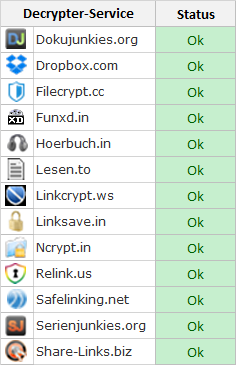 All supported Encrypter Services can be found here . Links can be added via DLC, RSDF or CCF container files. This makes adding multiple links easier and faster. Also you can export your download list as DLC container to share it with your friends or create backups. Captcha's are no problem for ShareDownloader aswell. ShareDownloader provides easy and comfortable ability to solve captcha's, which makes it ideal if you download as free user. ShareDownloader supports 9KW service, which allows you to solve captcha's automatically. 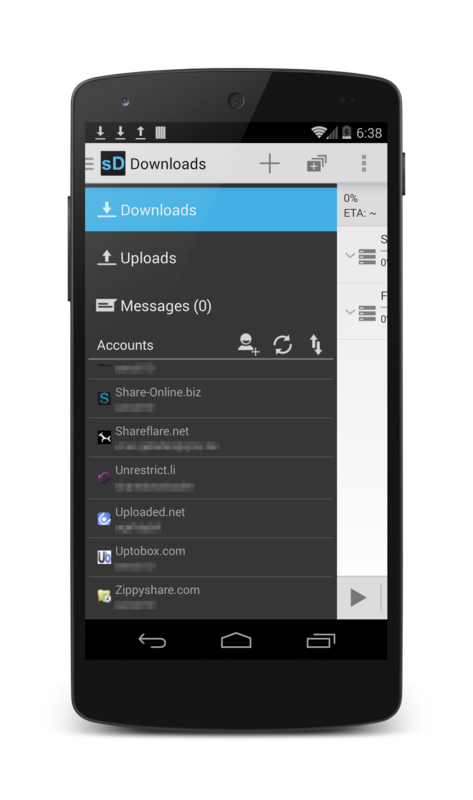 With the upload-manager you can upload files from your smartphone to your account and share it with others. You can upload up to 16 files at same time, or manage one queue. With integrated unpacker in Pro-version it is possible to extract zip, rar, 7z, bz2, tbz2 and tar files. Extractor finds automatically the right archive password based on passwordlist. In Pro-Version you additionaly have a Remote-Server and Web-Client. 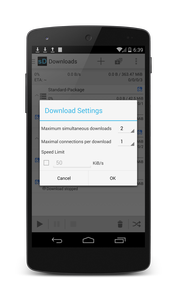 Web-Client provides you ability to manage your Downloads directly in your browser, perfect if you don't have your Android-device next to you. You can add downloadlinks and container, start, pause, stop or delete downloads, enter passwords, solve captcha and much more. The Chrome and Firefox Plugins allows you to add new downloads with just one Click in ShareDownloader. Information about your account, e.g. balance, traffic, points etc. Decrypt links directly from Share-Links.biz, Ncrypt.in etc. ShareDownloader is free and ad free, to ensure it in the future, we need your help. Maintenance and developement unfortunately, costs money. For every new hoster implemented in the app, we need premium accounts, which cost 5-10$ Google developer account also isn't free. With donated money we want to finance maintenance and developement in the future. WWe take no responsibility for the accuracy and completeness of the information provided on this website.